Pearl Harbor National Memorial Day, also known as Pearl Harbor Day, falls every year in the United States on December 7 to remember and honor the 2,403 US citizens killed in the surprise attack on Pearl Harbor, Hawaii, on December 7, 1941. On August 23, 1994, the US Congress determined that December 7 of each year would be the National Memorial Day of Pearl Harbor. On Pearl Harbor, the American flag is lowered to half-mast until sunset to honor those who died as a result of the attack on US Navy forces in Hawaii. Pearl Harbor Day is not a federal holiday - government offices, schools and businesses are not closes. Some organizations may hold special events in memory of those killed or injured in Pearl Harbor. 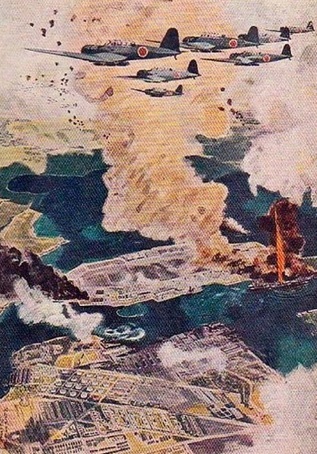 The attack on Pearl Harbor took place on the morning of Sunday, December 7, 1941, during World War II. Imperial Japanese aircraft attacked the American base in Pearl Harbor, Hawaii, which was the main base of the US Navy in the Pacific Ocean. At 7:55 am Mitsu Poshida, the leading Japanese pilot, gave the signal for the attack when he called "Tora, Torre, Torre". The attack on Pearl Harbor was seared into the American consciousness as an event of national disgrace, remembered to be a disgrace, and is considered the greatest intelligence failure in the history of the United States, until the terror attack on the Twin Towers in New York. The attack on Pearl Harbor caused the United States to enter World War II and, in retrospect, defeat Japan.